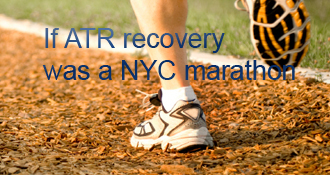 anniel has completed the grueling 26.2 ATR miles to full recovery! 24 weeks - has been a while since I posted here! Hadn’t realized quite how long it has been since I last wrote anything here… Think I went through a few bad weeks where I wasn’t making any progress so didn’t feel like I had anything new to write about! And it is frustrating when other people seem to be doing better - even though its great that they are - and shouldn’t really compare as we are all different! Am going to the pool a couple of times a week to do several repetitions of single heel raises, plus going down on a step and then raising (forget the proper term for that). And go to the gym on other days to use the bike and treadmill (varying the incline and speed) and doing shorter steps in order to engage the calf. Also doing double heel raises at home, and using the stretchy bands. The leg is still stopping me doing certain active things (and I am careful when rough ground or too many people) but for day to day stuff I don’t think about it too much (e.g. will get up out of a chair and swivel on it without thinking about it until afterwards whereas in earlier days I would be ever so careful how I was placing my feet!). Still a bit scrawny tho! Having read a few posts recently about overdoing it, I think I may have joined that club! Its now over 14 weeks since injury and I finally started driving again! (Probably delayed longer than I needed, but as it was my right ankle and as I didn’t really need to be driving I decided not to rush into it…) Passing the driving milestone is great My friends have been wonderful getting me places but having the ability to come and go as I want is wonderful, and so I have been driving into the gym every day, getting a bit carried away with the re-found freedom! I’ve been alternating between the pool (walking up and down doing heel raises at each end (single legged at the deeper end), and starting to do heel drops/raises on the steps) and the gym (30 mins with a slight incline on the treadmill at a fairly slow pace so that can concentrate on not limping, 15 mins on the hand bike and 10 mins on the stationary bike - which was a bit scary at first without the boot as my ankle felt kind of wobbly). And my heel raises in the pool are getting better, but I think I am also trying harder to push off when walking the lengths and find that I start getting cramp in my calf muscle sooner - which I suppose proves that I am doing something! Went to the cinema tonight and my tendon felt kind of tight - and cold - so I think tomorrow will be a day off from any leg exercises. Have been using the pool at the gym a couple of times a week, walking up and down the lengths for about an hour and doing 10 - 15 heel raises at each end, just on the bad leg at the deeper end! Today I also used the steps to do double heel raises so that my heel dipped below neutral. Leg was hurting a bit towards the end and felt shaky when I got out but feel like I am improving: the single legged heel raises were easier, and my stride was better, with a definite roll through and push-off on the bad leg. Had my first NHS physio appointment at the end of last week where he checked strength / flexibility and said was much better than last week, plus gave me a few more exercises to do. Not a lot really happened in it other than that, and I am not getting to do many exercises with the physio (again its all different depending on where you are / who you see!) but he did explain that the tightness I feel is because the collagen is still all mixed up and needs to be smoothed out by the weight bearing strengthening exercises etc, so that it will move more smoothly (although he obviously explained it better than that! )… so that is good to know. Am now at week 11 non-op and have used the pool at the gym for physio today and last Friday. For about 45 mins I walked up and down the length of the pool, doing 10 heel raises at each end. The walking wasn’t too bad (although had a tendency to move away from the edge so had to keep holding on) and I really concentrated on my gait and having an equal amount of time on each foot. On Friday it was noticeable that I am not pushing off on the bad foot, so I tried to roll through on that more, definitely lifting up my heel and trying to put weight on the toes before lifting it off the ground, and today it was much better. Heel raises were a little disappointing on Friday as I tried to do more with the bad foot and that’s when it became obvious how much (almost all) of the work is being done by the good foot :( So at each end I tried to put more of my body weight on the bad side. Could really feel it in my calf. Today it was still hard raising myself up using mostly my bad leg, but coming down on was a little slower/more controlled… Calf still feels painful when I do it - where have all my muscles gone!?!? Have been trying to walk more in 2 shoes every day, and am still doing the strengthening exercises at home (using towel/resistance band, and double heel raises) but am trying to decide whether to increase my physio visits - will see what he says when I go next week - but am still going privately as NHS physio dept has not been in touch and having tried several times to call and no-one has answered I am almost giving up on them! Friends are still being very helpful driving me to the shops and gym etc, but I would love to be able to drive myself… I haven’t needed to rush it so far, and as its a right ATR I want to be sure that I will be safe on the road, but I feel like I now have enough strength/confidence to use the accelerator/brake and do an emergency stop. But, I had a letter from the hospital, detailing the checkup I went to two weeks ago, which at the end said “patient can return to driving when she is able to tiptoe”! This seems (to me) a little excessive as I don’t drive normally putting the weight through my toes but through the ball of my foot, and I can do that now! Have rung up to query this (especially as the doctor only saw me for about 5 minutes) and will talk to my physio too. I am also not sure if I need to talk to my insurers about the injury - has anyone else in the UK done this before driving again? 10 1/2 weeks - more walking and skinny calf! Mini update at week 10 and a half (although there is not too much different to report…). I walked into town and back yesterday, unbooted / without a stick, which was the longest walk I’ve done for a while (was out for about 2 hours) and have to say that I felt a bit wobbly in both legs about half way through. Did think about getting a taxi back but just took it slow and steady and was fine. It involved a lot of downhill on the way in and uphill on the way back, but I negotiated both ok with only a brief sideways positioning of the bad foot at one point when it got really steep (as I didn’t want to stress the tendon too much). So I feel it was an achievement and although it ached a bit in the evening it was fine this morning. Elevating is still important as I was out Tuesday night (in the boot) and had my leg down all evening and when I got home I would swear that my bad foot was twice the size of the other! (slight exaggeration but it was noticeably puffy), but it quickly went down when I elevated. I also find that my bad leg gets really cold at times - does anyone else? Ankle still feels very tight, but reading other blogs at around this stage that seems normal, and it does feel looser after I have done the towel strengthening exercises. Have been doing more seated calf raises with my weight on my knees in order to help my standing double calf raises, and I am getting a little higher off the ground with those (although most of the work is still being done by my good leg and its obviously nothing like normal height on the bad). Am trying to believe that a little bit of muscle is coming back but the bad calf is still incredibly skinny, but that is just going to take exercise, time and patience! 10 weeks today! Officially updating status to 2 shoes!!! I’ve been spending more and more time in 2 shoes and feeling much more comfortable in them. Although I’m still in the boot for crowded events (pub/cinema etc) and for some exercise (wheelchair tennis/some gym work), but for general walking around the house and “safe” outside events I am in my shoes. And everyone who has seen me in the boot for the last two and a half months and now back into 2 shoes is very impressed! My shoe occasionally feels a little tight round the heel and the back of my leg still feels incredibly tight, especially if I’ve been elevating my leg for a while, so I am still sleeping in the boot so that it will feel ok in the morning (and partly concern about doing something bad to the ankle overnight) but am looking to see if there is anything I can get that is less cumbersome than the boot that will still keep my ankle at 90 degrees! Walked to the local shops on Saturday, unbooted! Something which would normally take me about 15 minutes (even in the boot) and it took over half an hour, so this is reminiscent of my first outings with the boot and crutches all those weeks ago… Am definitely still limping but feel like I am putting more weight onto the bad foot for longer and my good foot is going further ahead of the bad foot, so my gait is getting a little better. Do get some pain in the side of my leg, but think that is just where the muscle is starting to rebuild itself. Am doing the towel resistance exercises at home (now up to 10 sets of 10 reps at a time) two or three times a day. Also attempted standing double heel raises on Saturday and wow, so little strength there! Barely lifted my heel off the floor. I can feel the muscle/tendon trying (bless its little heart) but nothing is really happening. Did get a bit down about that, but tried again on Sunday and was able to lift a little higher and for a few more reps, and even better today! A little update on my 2 shoed progress after a few more days in them. Went to the physio on Weds, which involved massage again (which is always good) and he agreed with the strengthening exercises the NHS physio gave me last Friday. Plus said to do more work at the gym on building up the other muscles in my legs. Also some exercises for my toes to work those tendons - which at first I didn’t think could be done even with my good foot, but having tried a few times they may be possible! - these are to press the big toe down and try and lift the other toes, and vice versa… So I will be doing these exercises by myself and going back to the physio again when its stronger. He did say that shouldn’t ‘work through the pain’ as at this point it is still possible to cause micro tears in the repairing tendon! Went to the pub Tues night un-booted, but felt very wary with everyone milling around and not really paying attention (and had to move at one point so that my bad leg was better protected between some tables), so when I went out on Weds night I was back in the boot, which felt safer but also a step backwards - but right now safety wins! Walking round the block today I realised what was feeling wrong about my gait, and its that I have no push off power on the bad foot (which is fairly obvious at this point but these things take a little while to sink in :)), so even though I am rolling it from heel to toe I have already put the good foot down to take the weight. Plan on starting to use the pool at the gym next week for some supported walking practice which will hopefully help. And at the weekend I will also be starting on the two legged heel raises so will see how it goes putting full weight on my toes! 9 weeks and 2 shoes!!! I had read on here that it feels like a major step backwards going to 2 shoes, but hadn’t appreciated the reality of it. In my boot I am fast, getting places at almost my old speed and not really thinking much any more about whether I would re-injure myself in it. Without it I am back to snails pace (walked to a postbox which is about 2 mins round trip and it took me about 15!) and constantly having to make myself think about how I am placing my feet, and its scary (and I am tired of feeling scared about re-rupture)… So yesterday was a bit of a down day. 8 1/2 weeks and doctors checkup! Is now 8 full weeks since ATR and I have been walking around the house a little more without the boot on and my leg actually feels like it belongs to me again! My limp is much more noticeable without the boot, and am obviously slower, but I don’t feel as wobbly as I did a few days ago. Am still not doing it for too long and have a mini-panic if I get too far away from the boot… but am hoping that will go away with time… Am back to the orthopedic dept at the hospital on Friday and will hopefully get official permission to be in 2 shoes then (although I imagine I will be in the boot for a while longer when I am out of the house). Still doing ROM exercises several times a day, and have been going to the gym for upper body work and wheelchair tennis, so am keeping active which is good (even if its not quite the same as 2 footed tennis!). Am thinking of getting some sort of ankle support for when I am officially back in 2 shoes as I do worry about being completely unprotected, and also about having nothing to let other people know that there is something wrong and that I will be slower at moving out of the way etc (the boot is a great giveaway for that!). Did anyone else get anything for when they were first out of the boot? I know this is a few years too late Anniel, haha but anyway I am 14 weeks post Achilles rupture and couldn’t help but share similarities with regards to the injured leg feeling cold at times ! Certainly have noticed that . My ankle mobility is also bad but has improved immensely over the past 3 weeks with physio and hydrotherapy. I was negative 9 cm when I first performed the knee to wall stretch and 3 weeks of plugging along at that excercise several times a day I am now positive 1 cm. I still also get swollen foot and leg usually towards end of the day but it seems to go down as soon as I elevate my leg on a bed or couch. My PT suggested that most of the stiffness around this time is probably not due to the achilles tear itself, but from having it immobilized and needing to retrain everything around it. Also, from what I’ve read, swelling is really different for everyone at that stage. But you shouldn’t have to worry about the swelling due to the injury. At that point its from general blood and fluids pooling down there due to lack of muscle contraction to send it back up to the heart. Ice might not be necessary, just elevation. Anniel - Be careful raising your body completely on your bad leg. In the pool there is less force on the tendon but out you could find the force too much. It is early days as Hillie said. Anniel - sorry again for being late with a reply to your question. I have been dealing with a bicep tendon rupture and now looks like surgery tomorrow. There is not much of a non surgical option for me as it appears the tendon has torn from the bone. Regarding your tightness - It will be like that way for some time to come, probably until you can walk without swelling, but deep massage around your tendon and ankle will help. Better doing the massage before exercise so you are not having to rub through all the swelling. Just adding a comment to my first blog as I don’t think I ever wrote it down anywhere and it might be helpful, but one of the things I did when I first got the boot and realised how much bigger it was than the cast (so that I couldn’t fit trouser leg over it), was to take a oldish pair of jeans, cut the stitching on the outer side seam (from just below the bottom of the pocket down to the hem) and sew in a long zip - with the open end about 6inches from the hem. This meant I could slip on a pair of real trousers without having to take off my boot at a time when I was still feeling incredibly fragile about my ankle, and most people didn’t even notice the zip at the side (and I sewed on a few ties at the bottom so that the open ends could be held together - as one attempt with the zip right down to the hem bunched up too much above the top of the boot..). hillie: thank you for that - very informative - and when I say I did physio in the pool it was on my own, but because my private physio had said it was something I could start to do now I’m in 2 shoes! I only saw an OS at the end of week 1 when I went from cast to boot, and then at the end of week 9 when I was given official permission to wean off the boot - and that was a different OS who really spent very little time with me. But the NHS physio who came in after I’m sure said that driving would be ok when I could do an emergency stop! I still find it weird how much protocol and advice varies from place to place… as it sounds like you had a good NHS physio experience! An emergency stop can put a lot of force on the ball of your foot, maybe comparable to walking tiptoe. If you’re good at hitting the brake with your heel, you could be safe sooner. Love the writing, Annie! Don’t forget that choosing a different depth changes the challenge to your leg. My NHS clinic told me that I could drive when I could do an emergency stop. Mine was a right leg injury too and I started to drive at about week 9 or 10, when I was comfortable in 2 shoes. As for physio, it varies enormously all over the UK, all over the world judging by the posts here. I was on a fast protocol but still only saw the OS for diagnosis (and went non-op), after which I was in the hands of the physio with fortnightly visits to the specialist AT clinic. When these visits ended after 10 weeks I saw another, very good, NHS physio for about 6 weeks, after which I had a number of sessions with a sports physio to guide my further recovery. Heel raises - you’re doing ok. It is very early yet - some to succeed at this stage but not many. I was at about 18 weeks when I could do it on only my injured leg but many struggle to do it ever. I measure my calf a month ago at 9 months after trying on a dress and seeing the big difference. It was still 1 1/2 inches smaller!! That is 1/2 inch growth in all this time, even with lower body weights. Shocked me, but I decided it was the least of my problems. Your walk sounds fabulous. Just be careful you do not do too much. A setback is never fun. Anniel - I know this is coming in a bit late but I am not here as much anymore. Remember at the stage you are at calf raises are actually more about the going down than the going up. Going up on your good and transferring some of the weight to the bad as you go down in a slow controlled manner. It is good to read your progress and the walking you are doing is fantastic. Try to keep you steps at a pace and length so you do not limp and you will walk further. The swelling will eventually go away and the calf will return. Sounds and looks good. Welcome to the non-symmetrical calf club. Mine looked very similar early on. The size may not all come back but at least you will very likely have full function. That’s the important thing! I did it - resized the picture in iPhoto - and it worked… Looking at it I almost don’t want to have posted it, but will be good to keep a record as hopefully as the weeks go by I will be able to post a picture of a ‘fatter’ right leg! I would skew my op foot out to laterally a little going uphill for a good while. It just naturally, as it healed, went back to normal when I walked uphill. I actually just noticed the other day when we were golfing. hi david - it is great being able to move around without the boot, and to be building up a little more speed/confidence.. you’ll soon be there interesting you’ve felt the cold too - its weird - wonder if its because the blood flow isn’t as good as the muscles aren’t helping as much there??? Great idea switching the perspective — and sounds like you’re already showing some solid progress on those raises! Keep it up. My anti-spam word to post today is “patience”. It’s a great word for all of us in this club. My heel raises are getting better but there is no way to do single heel raises yet. I injured myself on 12/16/13 and had my surgery on 12/31/13. My walking is getting better this week. If I rush, I do limp a bit. I’ve been back to my spin classes and standing a little bit more out of the seat. No shame at all, going back and forth between shoes and boot. Congrats! This was the second hardest part of the journey for me (immediate post op NWB being the worst for me). I remember being disappointed I couldn’t even go 1.5mph on the treadmill at my first PT session. It will come along little by little. Now at a little over 5 months out, I have found that I am doing things I used to be able to do (run up the stairs on balls of my feet) that were impossible only a few weeks ago. Congrats Sporti! I hope to be moving FWB in the boot as swiftly as you as the weeks progress! I am having a hard time getting away from crutches! And thank you all for your congratulations and similar stories (good luck to you too) - you definitely need to get your mum reading on here Rob. I’ve told a few “healthy” friends about the site and they are very impressed! Great post! As I wrote in my blog last night, I am amazed at myself, after many others wrote about it, for even having the notion that things will “magically” be better once I get to two shoes - until the reality of it sinks in. As Norm says, it’s bittersweet, but good things are ahead. It’s funny, over the weekend, my 6yr old daughter loves to tattle on me to my parents when we saw them “Daddy was outside walking around without his boot!” My mother is still beside herself - she needs to keep up with my blog! Yes, it’s a bittersweet “milestone”, yes it’s slow and awkward and scary. But it’s an important and necessary step back toward normal, too. And another thing: the next few days may include the most spectacular progress in the whole ATR rehab, as you quickly move from “Yikes! I can’t DO this!” hobbling, to walking ALMOST 100% normally in shoes! Savor it, because what follows is “the frustrating plateau” (h/t to doug53), when you can’t believe you’re STILL not QUITE at 100% normal, weeks or even months later! But don’t forget to Watch Your Step! And stay incremental, too. Congratulations! I’m sure it does feel like a step backwards but it sounds like you’re making great progress! I’ve put that tip up lots of places, including one of my newest pages. Between the site’s search and your browser’s ctrl-F search in page, it should be easy… KG nailed the elevator-pitch (UK: lift pitch?) version above. @annie: I didn’t notice any tightening over night. I was non-surgical though. I don’t know if that makes a difference. I remember having to catch myself in the am when doing my morning stretch in bed–forgetting that the injured leg wasn’t as flexible as the other side! As for going down the stairs, I used to go one step at a time and hold on to the rails. Eventually you can place the foot of your injured leg over the step (at the arch) and kind of roll off. I got that tip from Norm. Early on though, I just went slowly. It’s so hard to be patient but it really does seem to work out in the end. You will be bounding up and down the stairs on the balls of your feet in no time! I am looking forward to not sleeping with the boot on Kelly - but did you find that your tendon tightened up overnight without it? Sounds good. I think the limp is pretty difficult to avoid. That weakened foot is out of practice. For me, walking was the best medicine–even if you have to shorten your stride a little or slow down. I’ll keep my fingers crossed that you can ditch that boot at night soon. It’s heaven sleeping without it! Good luck. I found a spare cane in the extended family, and I carried it on “outings” long after I stopped needing or using it for support. Several benefits: Somebody thinking of bumping or tripping you is warned that you’re vulnerable AND that you’re armed! Sounds great guys - I’ve just started to crutch around the house without the boot and perhaps 50% weight on the bad leg and your descriptions are obviously spot on and key for me since I’m 2wks behind you both. Exciting for all of us! Instead of trying to push off, just start with shifting your weight to the ball of your bad foot at the end of each stride, then lift it up flat without trying to push off. I built up the strength to hold my weight on the ball of my foot first and that gave me a lot more confidence I wasn’t going to just fall over if I got ahead of that foot! anniel’s AchillesBlog is proudly powered by WordPress and WPDesigner..